If you've been to this blog more than once then you know that I sporadically post about the homeless. For my entire life I have had a weakness for them...how they got there or what led them to their current situation. No little kid thinks to themselves they want to grow up to be homeless and no mother hopes their little baby to grow up and live on the street. But I'm jumping ahead as I often do (or actually jumping behind). Anyhow, I was in the beautiful and vibrant city of Toronto this past weekend with my three sisters, and like any big metropolis there are a large number of people living on the street. Often I will stop to talk and on this weekend I did with only two of the people I saw. David is one of them. 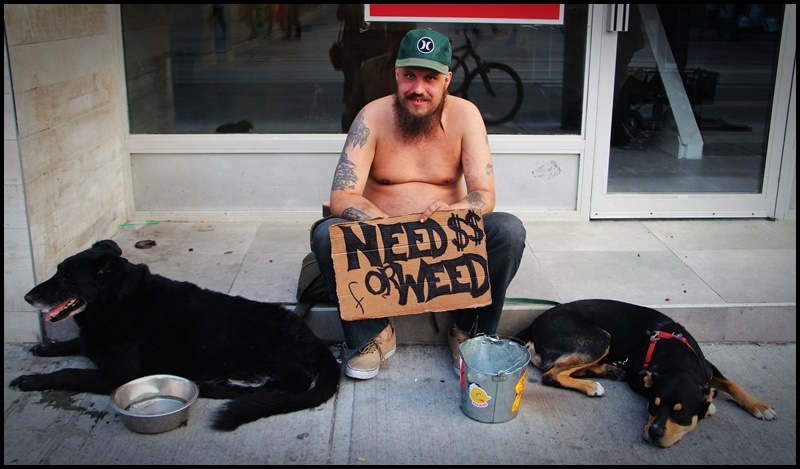 I walked passed him on Queen Street West and he caught my eye because he was sitting between his two friendly dogs, but mostly because of his sign (one can be homeless and still have a sense of humor, and despite his predicament I could see right away that he was a rather jovial guy). After dropping a couple dollars in hi pail I asked if I could take his photo, to which he readily agreed. After introductions, I asked if his sign was true...if that's really why he was begging for money. He laughed a little and told me that while he does smoke weed he was really trying to get money to eat, but he's found that--even though it pisses some people off--a sign like that makes people see him. After shaking hands and petting his dogs I wished him luck and walked on my way on a beautiful if not balmy summer evening. Peace David, I hope you got some food (and weed).